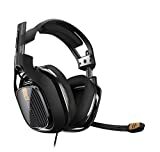 The ASTRO A40 Gaming Headset has always been considered the best gaming headset available, packed with loads of functionalities; the Astro A40 gaming headset has met the expectations of its many users. Ever since it was launched in 2008, it has been the console and PC gaming solution to game lovers. The A40 has seen some upgrades since it’s launched but there has not been any change in the quality of sound it gives when in use. The new version of the A40 gaming headset has an option of MixAmp, this will allow the use of the headset with PlayStation and Xbox consoles. Though the function of the MixAmp is not only restricted to the gaming console, it can also be used on mobile phones with the right adaptor. Though the MixAmp is not sold together with the A40 headset, it is advisable not to go for the lone headset, but to get them both. The updated A40 headset eliminates the pitfalls of its previous version with some adjustment that was done on the new release. AstroGaming the producer of this magnificent headset made sure of the audio quality, which is now very clear compared to the predecessor, they also took care of the drops that plagued the previous version. If the quality of the audio is what you crave for, the MixAmp Pro TR is the choice for you, the A40 headset features a shorter cable that connects the headset to the receiver compared to the older versions of the headset. The A40 gaming headset is equipped with the ability for you to have a full control of the volume even when chatting, it features digital 7.1 surround sound and built for only a stereo output. The headset is designed in such a way that covers the hearing range of the human ear. It gives out the frequency range of 20Hz to 21kHz which covers the human hearing range, this headset is built to the highest perfection. The build of the A40 headset is very comfortable due to the way it is designed, equipped with a well-built headband and ear coupling that makes it very comfortable for use. The A40 gaming headset features a dual 3.5 jack for PC connection and it is compatible with most audio devices. The A40 gaming headset is good value for money, as it gives the user a lot of freedom over its usage, from the volume control to the comfortability it offers and the numerous functions that it offers. You will not have any reason not to be happy for spending money buying the A40 gaming headset, it is really a worth for the money. Though as with other gadgets, the headset has its own set of pitfalls. It features many wires that can make cable management an issue, also a complaint of the shorter cable that makes couch gaming a bit harder but it is very comfortable on a tabletop gaming experience, that is comparable to other top-tier headsets like the Kraken and A40. This headset can only be described as the best on the market. It provides great value for money, with outstanding audio quality and comfort. There truly is no other headset that can compete.